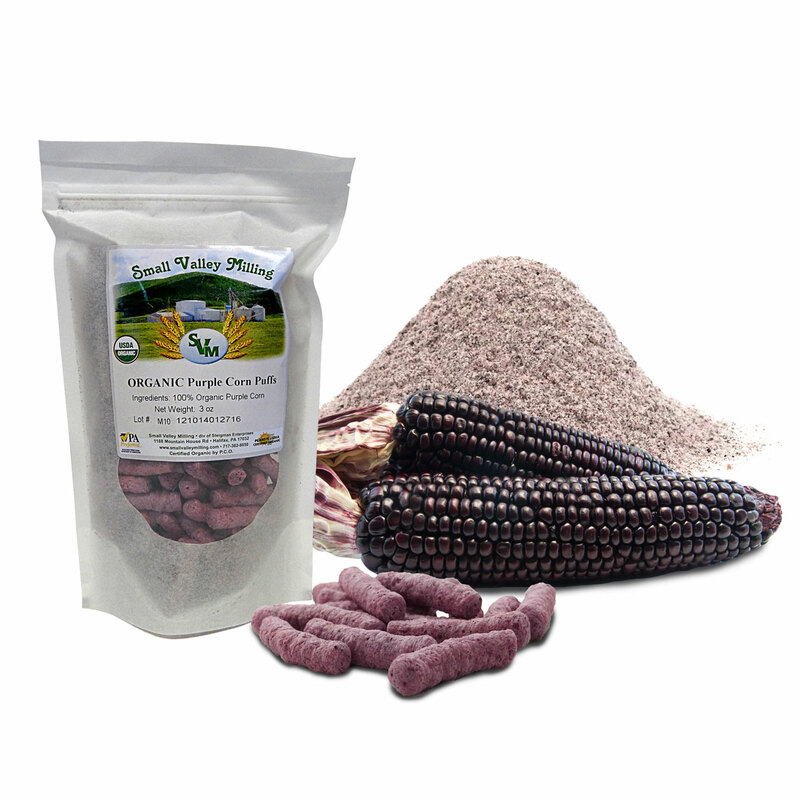 We are excited to announce the release of our Organic Purple Corn Puffs! After grinding our purple corn kernels into a coarse meal, the puffs are extruded right here at Small Valley Milling. Through a combination of extreme pressure and heat, our extruder produces these beautiful, lavender-colored puffs. 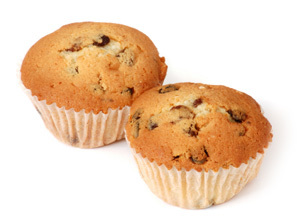 We do not add anything else to the machine in the process of making puffs- no salt, no dyes, no anything! 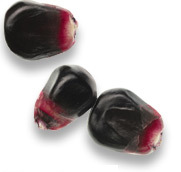 It’s just organic purple corn, and it tastes delicious! We can’t wait for you to try this new line of products! Shred 2 large onions. Drain all the onion juice off. Place onions in a small sautee' pan. Sautee' onions until slightly brown. Allow to cool. In a large bowl, whisk the spelt flour, and salt. Add the olive oil and water to the flour. Stir with rubber spatula until it collects into a soft, crumbly ball of dough. Use the spatula or your hands to press the dough against the sides of the bowl to mix all the flour. 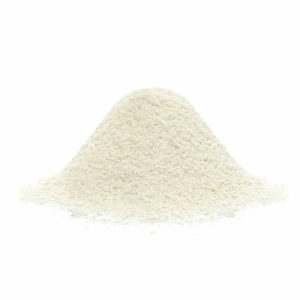 On floured surface roll some of the dough until it is very thin. With a pastry brush, brush the dough lightly with water, then spread some of the onions over the thinly rolled dough. Sprinkle with kosher salt and seed mixture. With pizza cutter cut the dough in rectangles about 2 in by 4 inch. 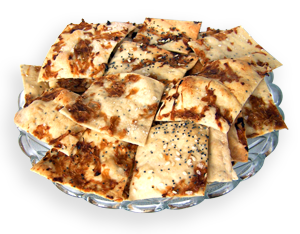 Do not bother to trim edges, uneven edges add character to the crackers. Transfer the dough to a baking sheet. Bake until nicely browned about 10 minutes. Repeat until all dough is rolled and baked. Store the cooled crackers in a sealed container or plastic bag. They will keep up to a week. You can put seeds in dough instead of sprinkling on top of crackers. Try different spices, garlic or your favorite seeds. Warm the milk and add the yeast to the warm milk. Add 1 tablespoon of sugar to the warm milk and yeast. Next melt butter in microwave. Pour warm milk and yeast into the bread maker, add the 3 cups of spelt flour and salt, then add the melted butter. Turn on the breadmaker and knead the dough only until the flour has all been stirred in. Be careful to not over knead. Allow the dough to remain in the breadmaker to rise, but do not let it knead anymore. Allow the dough to rise to double its's size in the breadmaker. Transfer dough to a floured pastry sheet and roll dough to a 12x 14 inch piece. Spread with room temperature butter and then sprinkle the brown sugar and cinnamon mixture on top of the buttered dough. Roll dough up from the longest side. Cut roll in half, then cut in half again and cut those pieces in half. This will give you eight buns. 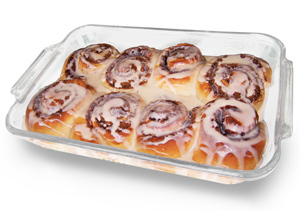 Bake in an 8x12 buttered glass baking dish. Place each roll in the buttered baking dish. Place the pan of rolls in a larger pan with 1 inch of boiling water in it. This will keep the rolls very moist. Place the rolls in a cold oven, and set the temp to 375 degrees. Bake 35-40 minutes till the rolls are a nice golden brown. Mix together all the ingredients for the glaze and frost the rolls while they are still warm, not hot.